Although there are several theories no one really knows where the celebrations all began! A “Fiery Dragon” (possibly a large meteorite) is reputed to have appeared over Helston many centuries ago and dropped a large stone on what is now known as the “Angel Yard”. More than a century ago, this great stone was split up to be used for building; a portion was built into the outside wall of the Angel Hotel in Coinagehall Street. The inhabitants of Helston, after fully expecting the town to be destroyed, celebrated their deliverance by dancing through each others houses. The late Mr. Henry Jenner, an antiquary of national reput, contributed the following to the Western Morning News, May 11th 1931 – “It is quite probable that the Helston `Furry` observances are a survival of a pre-Christian Celtic custom transferred, or fixed on, to the patronal feast”. St. Michael, to whom the parish church is dedicated, is Helston`s patron saint and May 8th (Furry Day) appears in the Church Calender as the anniversary of the Apparition of St. Michael. It is therefore, quite feasible taht the pre-Christian “Furry” was acquired by the early Celtic church and celebrated annually on May 8th. It is significant that the Furry Day at Helston is heralded by an early morning ringing of the parish church bells. In several Continental and Eastern Mediterranean counties “labyrinthian” dances are celebrated. 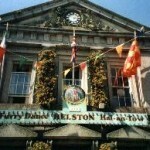 The “in and out of the houses” feature of Helston`s Furry Dance is claimed by some authorities to be of this type of dance. Beyond doubt, the “Furry” has been danced at Helston for centuries by all. Although it is an occasion of great joy and fun, it is ever decorous, refined and elegant.